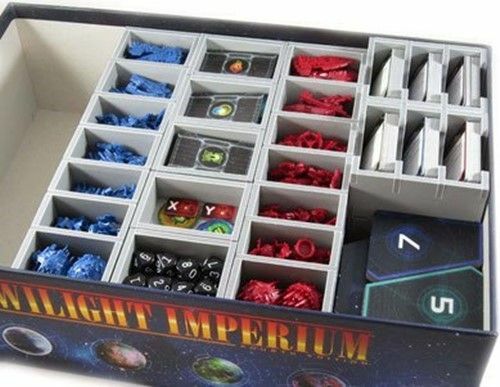 This insert is designed to be compatible with Twilight Imperium 4th Edition, and has space provided for future expansions. The design provides both efficient storage and improved game play. Many of the trays can be utilised during the game, and they greatly aid set-up and clear-away times. The rules and boards act as a lid on top of the trays. Please note that there are two alternative methods of storing this insert in the game box, please see Folded Space's website for more details. Note that there is space left for expansions. This is to future proof the insert, and we will be providing an additional insert for this gap when the expansion is released. The boards hexes and numbered tiles are stored in an open slot in the bottom right corner.